I am in complete astonishment that this weekend is already Memorial Day. The (un)official start to summer. How did this happen? I’m still sort of half-waiting for the meteorologists to tell us that a freak snow storm is on its way. That’s probably not going to happen at this point, so let’s get started on some summer food. It’s time to get those grills fired up! These chicken drumsticks are the perfect way to usher in the new season, and they take grilled chicken to an entirely new level. They start out with quick brine, soaking in a mixture of water, salt, and brown sugar. Then, they’re patted dry and covered in a smoky paprika rub. Onto the grill they go, and then they get slathered in the most amazing spicy apple glaze. Yesterday, I wanted to cover everything in salted caramel sauce. 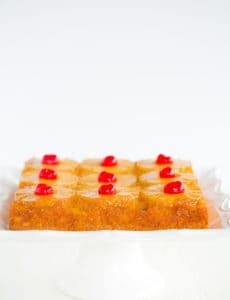 Today, I want to smear this spicy apple glaze on every savory piece of food I meet. Usually, chicken on the grill would rank a lowly third for me in terms of cookout meat choices. First, I’ll always take a completely charred hot dog (I don’t like them any other way! ), then comes hamburgers, and then… chicken. Truly, though, I don’t often encounter chicken at cookouts, but this one recipe has completely turned my preconceived notions upside down. It helps that the drumstick is my favorite part of the chicken, but between the rub and the glaze? Oh my. They’re smoky, they’re spicy, and they’re sweet. A trifecta that results in amazing grilled chicken. 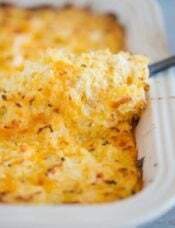 I couldn’t think of a better side dish to go with this chicken than my favorite Jalapeño Cheddar Cornbread – an old favorite that I love to make as often as possible. 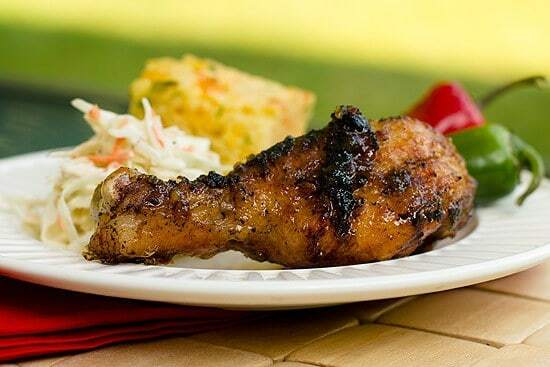 These drumsticks will definitely be making repeat appearances on the grill this summer! I tend to fall victim of getting stuck in a chicken rut and preparing it the same way over and over, and I’m thrilled to have had such an amazing recipe break the vicious cycle. Here’s to delicious, inventive, and not-the-least-bit-boring chicken! What’s your favorite food on the grill? In a large mixing bowl, combine the cold water, kosher salt, and brown sugar. Stir well to dissolve the salt and the sugar. Pour the mixture into a gallon-size zip-top bag and add the chicken drumsticks. Seal the bag and refrigerate for at least 1½ hours, turning the bag occasionally. While the chicken sits in the brine, prepare the Smoked Paprika Rub. 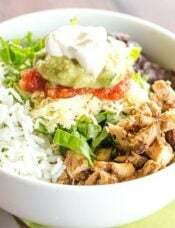 Combine all ingredients in a small bowl and set aside. Next, prepare the Spicy Apple Glaze. 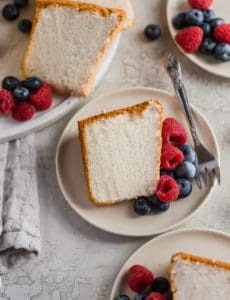 Combine all of the ingredients, including the vanilla bean and seeds, in a 6-quart saucepan and bring to a boil over medium-high heat, stirring often to dissolve the sugar. Once the mixture has come to a boil, reduce the heat to medium and cool until it is reduced to about 1 cup and has a glaze consistency, 30 to 35 minutes. Remove the pan from the heat, and strain the glaze through a fine-mesh sieve into a bowl. Discard the solids. 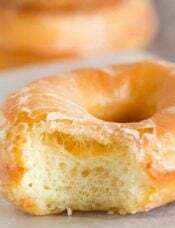 Set the glaze aside until ready to use. Remove the chicken from the brine (discard the brine) and pat the drumsticks dry with paper towels. Season on both sides with the Smoky Paprika Rub and let sit at room temperature for 30 minutes. While the chicken is resting, preheat the grill to a medium-high heat. Spray the grates of the grill with nonstick cooking spray or brush them with olive oil. 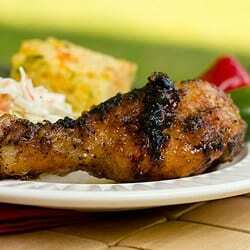 Place the drumsticks on the grill and sear for 2 to 3 minutes on each side. Once they are seared, move them to a cooler part of the grill and close the lid. Cook for about 20 minutes, or until cooked through. 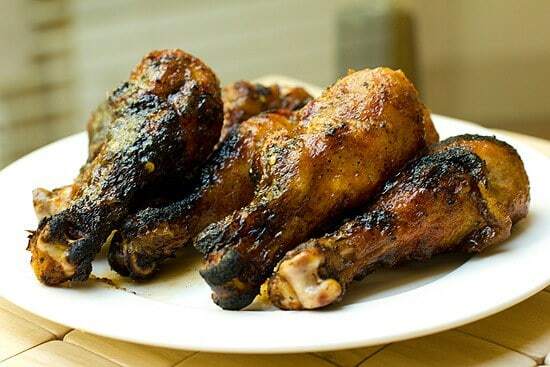 During the last 5 to 10 minutes of cooking, brush the drumsticks all over with the Spicy Apple Glaze. You can apply multiple coats of the glaze if you like. 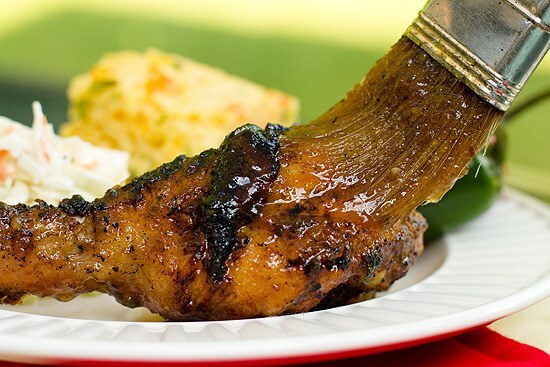 Remove the drumsticks from the grill to a clean plate and cover with foil if you're waiting a few minutes to eat. Serve with an extra drizzle of the Spicy Apple Glaze, if desired. Note: I couldn't find the cardamom pods at the local grocery store, but I was able to pick some up at Penzeys. Can I brine over night to grill when I get off of work? 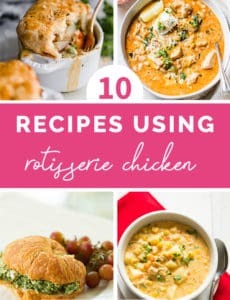 I know this is an old recipe but I came across it in the “summer recipes” list and I had to say…SWEET JESUS, this is by far one of the best chicken recipes I’ve ever tried! I could honestly drink the glaze, it’s so delicious. I made about 8lbs of drumsticks (I have a big, hungry family and we like leftovers), so I doubled both the glaze and the rub. I simmered the glaze for about an hour before it thickened significantly and ended up with just under 4 cups of it, so naturally we have a lot left, bit I can’t wait to pour it on anything – I bet it’ll be amazing on pork chops! There was a bit of leftover rub, and we all felt it was a bit on the salty side, especially since the chicken was already brined, so when I make it again I’ll probably half the salt. Besides that though, it was so amazing. Can’t wait to eat leftovers for lunch! I came across this recipe recently & made it over the weekend. I decided to skip the glaze because of the special ingredients needed & used sweet baby rays raspberry bbq. My question though is- 3 T seems like a ton of salt in the rub. Is that correct? I wasn’t sure & decided to use just 2 t, seemed fine. Also, did you use all of the rub then? Hi Marcie, I did not use all of the rub, there was some leftover. I am tempted to try the recipe but I cannot use any ingredient with alcohol in it. Is there a substitute for the apple cider? Hi Min, Apple cider does not typically have alcohol in it. Just made these tonight for my hubby! OMG!!!! Sure to become one of our regular favorite recipes in our house! Thanks! Had a question about the vanilla bean, cardamom pods and allspice berries? Can I find them in supermarkets or do I have to go to a specialty store for this? Hi Cat, Vanilla beans you can definitely find at the grocery store, and I found the allspice berries there as well. The cardamom pods, however, I purchased from Penzeys. Killer recipe! I am def making these this summer! Recipe saved and you got the buzz! the legs are looking good and the smoke paprika yum yum. 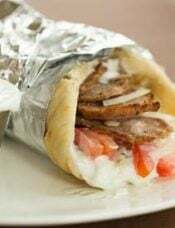 I love kebabs, thats my first choise. That chicken looks amazing. I also was waiting for a freak storm to come and it never did. I am totally weirded out by the fact that school is almost over for the year and it feels like it is still September and it just began. Ok, you hit it out of the park this time! My favorite way to cook chicken wings is on the grill. Takes out the deep frying and the guilt . 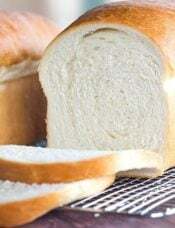 However, I am going to try this recipe with drum sticks, which my son loves! Thanks for the tip. Just in time for Memorial Day! So glad you brined the chicken before cooking it. I’m writing a piece on it too. Oh my gosh, this looks delish! Chicken is probably number 1 on my list of cookout foods. I am going to add this link to my Memorial Day Round-up tomorrow! Thanks! You are the reason I keep running out of printer paper. I’m not complaining, just sayin.’ Although I have lots of e-toys, I prefer to print out my favorite recipes in a format I created and keep them in ring binders. I know, so Edwardian, Mrs. Bridges, etc. 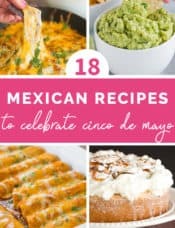 Thanks again for being my favorite recipe source. I love beer soaked brats (not the kind from the store, the ones you soak yourself). Then I caramelize the onions and add some garlic for a great punch of flavor. Mmmm…. This glaze and rub sound incredible! Never would have thought to do an apple glaze. Great idea! Love the idea of the spicy apple glaze! I love Chicken Drumsticks and the apple glaze sounds so good! It’s a good thing drumsticks are on sale at the grocery store this week. Hello Memorial Day Weekend BBQ! I see some homemade coleslaw on the side, too! I love chicken on the grill it’s my second favorite next to a raspberry chipotle pork tenderloin. I must try this! Wow, this looks great! I love the brining and then the addition of the spicy rub. I love the flavors of this chicken. I love smoked paprika, it’s one of my favorites spices. Nice deep flavor! Have to try this out! For the glaze- What is the difference between cider vinegar and apple cider vinegar? Hi Kathryn, None, they are the same thing, sometimes you’ll see it as one, sometimes the other. Do we use 4 cups of the apple cider vinegar for the glaze? Hi Kathryn, My apologies, that first line is a typo – it should be 3 cups of apple cider. I have made the correction above. Thanks for catching that! Yum, smoked paprika and this glaze sound great together. These chicken legs look so good. That glaze sounds absolutely decadent. And I’m sure it would be an amazing pairing with the jalapeno cornbread. I am the same way – hot dogs are my first choice at a cookout, hands down. I love the apple glaze on this chicken – looks yummy! I love my hot dogs completely burnt, too. It’s great because it means everyone likes me at a BBQ since I will eat the burnt hot dogs no one else wants. What is smoked paprika; I don’t even know what it is, but I can imagine and I want it. Smoked Paprika is just that, a paprika with a smokiness to it. It used to be hard to find a few years ago, but these days you can get it in the average grocery store and even Wal-Mart. I found some on Amazon years back when I first heard of it and it came in a three pack of flavors, Sweet Smoked, Hot Smoked and a Bitter-Sweet Smoked Paprika and I’ve been buying those ever since. If you like a smokiness you must try it! Hi Margot, Ditto Jackie. It’s paprika that is more smoky than sweet (sweet is the standard paprika), it has a mesquite smell and flavor. It’s stocked at my local grocery store with the rest of the spices and herbs.